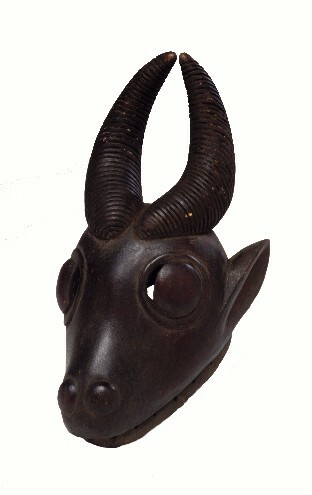 11" x 9.5" x 15.25"
Wearing this streamlined, sleek waterbuck (kobus defassa) mask on his forehead and a costume of palm-frond or reed grass strips, the dancer imitates the gait of the animal. The large eyes and full nostrils of the mask capture the attention of the all-male audience (in this case the Djé, a men's association) as the mask-wearer begins a ceremony that may decide peace or war, guilt or innocence, and justice. For a woman to look upon this mask would be a fatal mistake. The dancer ends the ceremony by lighting a fire that others will jump over. Bibliography: Fagg, 1980, p.58; Hahner-Herzog, 1998, p.36.